The “Sounds of the City” workshop taking place in Dee Street Community Center this week gave participants an opportunity to share field-recordings made since our last session and engage in listening and recording exercises. The group began by playing back one member’s contribution; the rumble of bus engines found online, household sounds, and the distant barking of a dog. This brought about a discussion of the process of making this recording. Our next listening exercise invited participants to identify a narrative from an unidentified field recording. The group then moved outside to record the sounds of our footsteps moving up and down Dee Street. This activity intended to provide sound material, later to be processed, to represent the past sound of workers returning home from the shipyard. Older members of the community had previously commented upon the thunder of men returning from the yard each evening. Our final exercise involved listening to a field-recording, then using post-it notes to reconstruct our listening experience in the workshop space, marking around the room the audible details of an abstracted space known only through sound. 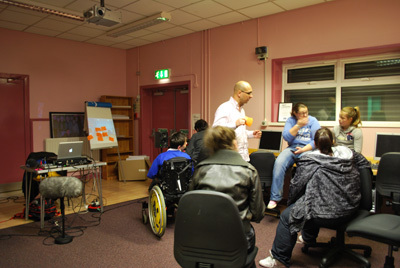 This workshop served as an introduction for participants to various process’ of listening and sound documentation.